Enables caregivers to assist patients with Walking, Exercising and Transferring Product has a plastic locking buckle Comes in either a 54" or 72" length belt. 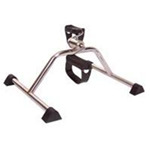 Great For Users Trying to Restore Mobility in Upper or Lower Body Made from Chrome Plated Steel Deluxe Non-Slip Tips for Stability Adjustable Tension Knob No Assembly Required! Helps Restore Shoulder, Arm & Upper Torso Mobility. Installs Easily Over Any Door, to be used under physician's supervision only.